Houston, February 15, 2019 - PVI is proposing a Joint Industry Project (JIP) on optimizing displacement efficiency for cementing operations. It covers a full computational fluid dynamics (CFD) module on top of CEMPRO+ with 3D visualization of flow and fluid concentrations, laboratory testing, literature review, case studies and two forums. To learn more about this Joint Industry Project, please click here. Houston, August 17, 2018 - We are proud to announce that University of Louisiana at Lafayette and Pegasus Vertex, Inc. (PVI) started a collaborative research of characterization of lost circulation using field data and selection of lost circulation materials based on computer simulation. Over the years, PVI has worked with University of Louisiana to aid in the educational development of oil and gas industry professionals. March 14, 2018 - PVI is pleased to announce to be the winner of the 2018 Special Meritorious Awards for Engineering Innovation. 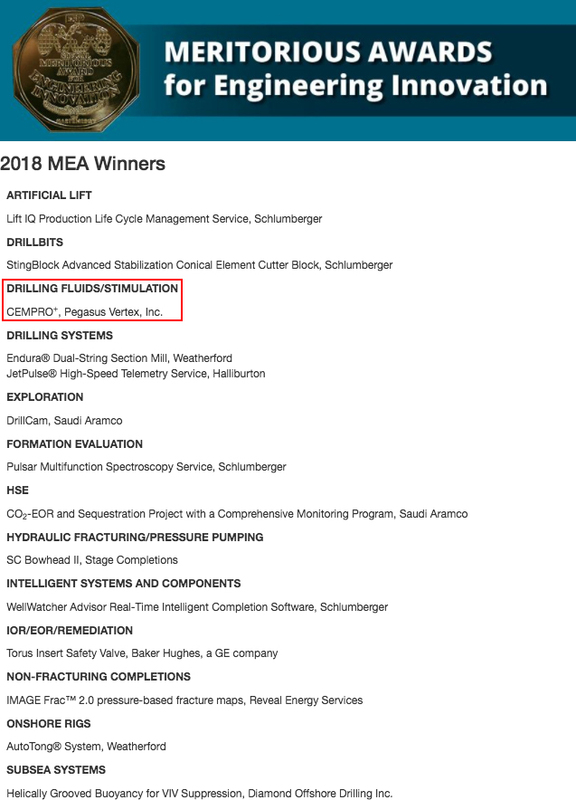 They were awarded by Hart Energy based on their area of specialization, for PVI it was Drilling Fluids/Stimulation with the winning software being CEMPRO+. PVI strives to create sophisticated, simple products, with technological advances that helped them achieve this prestigious award. Houston, September 18, 2015 - Determined with supporting the engineering professionals of tomorrow and giving university students the tools they need to succeed with state-of-the-art drilling software, PVI has once again contributed to the University of Southern California (USC) by renewing the software drilling license for another two years. The software license renewal is equivalent to 2 million dollars of advanced drilling software technology used by numerous operators and service companies around the world. Over the past two years, students at the USC Viterbi School of Engineering, a leading institution for engineering education and research, have had the opportunity to gain real experience with in-well planning, drilling engineering, and trouble-shooting for drilling operations. PVI’s contribution to this academic institution is sure to assist future oil and gas professionals as they embark in their careers. Houston, May 12, 2014 - This past weekend PVI hosted the 2nd Annual Oil and Gas Golf Tournament benefiting the Houston Food Bank. The event held at the Augusta Pines Gold Club brought together various individuals from the local oil and gas scene. It was a fantastic opportunity to socialize with colleagues and network, all while supporting a good cause. PVI is proud to have hosted such a wonderful and successful event, and would like to thank all those who were involved and contributed to this incredible charity! Houston, October 29, 2013 - PVI has donated our state-of-the-art drilling software, worth $2,000,000, as a gift-in-kind to the University of Southern California's Viterbi School of Engineering, as part of a commitment to bring students on-ground experience and support their skill development as future oil and gas professionals. "Education is the foundation of success for future generations," said PVI's President, Gefei Liu. "We believe that our drilling software can bridge the gap between academia and the industry by allowing engineering students to quickly acquire experience and develop their capabilities to solve drilling problems. We are honored to be able to partner with the USC Viterbi School of Engineering." The software, widely used by many operators and service companies worldwide, will enable engineering students to gain experience in well planning, drilling engineering, and trouble-shooting for drilling operations. "PVI drilling software, as a gift-in-kind, directly supports USC Viterbi in maintaining its position in the world as an elite institution for engineering education and research," said USC Viterbi Dean Yannis C. Yortsos. "We are proud to be affiliated with PVI and I look forward to our continued partnership." Under the Mork Family Department of Chemical Engineering & Materials Science, USC Viterbi's petroleum engineering graduate program is one of the oldest in the country and offers Master of Science, Doctor of Philosophy, and Engineer degrees, as well as a certificate program in Smart Oilfield Technologies.